around the studio | Flickr - Photo Sharing! I store so much in suitcases, but can never remember what's where. I finally put tags on them all (tags by mav!). Ah!! ☆∴°, aetches, hippie surfer girl, and 8 other people added this photo to their favorites. 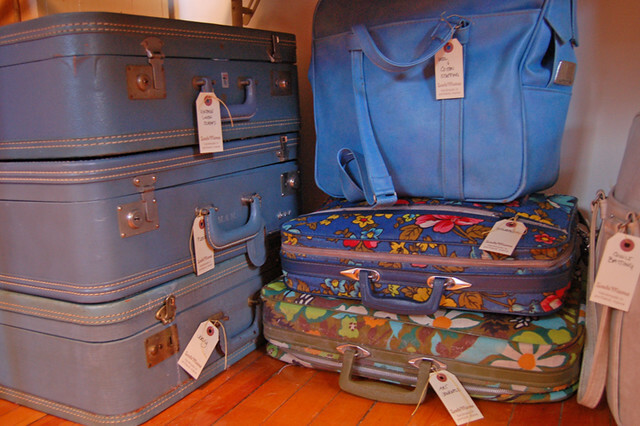 your vintage suitcase collection is pretty impressive! These are gorgeous - especially the two floral ones. this is how much of my stuff is stored. it works so well and looks great! This is a brilliant idea for so many reasons. Great idea for storage! Those blue suitcases are perfect for decoupaging fabric onto-I did one for a friend with toile and trim..SO cute! oh my goodnes!! i saw the blue suticase on the right there, that little flowery one, i debated for an hour if i was going to get it or not, i didnt get it. :( now that I see yours i wish I had gotten it. it was so cute!! LOVE this.... and i have that blue bag too! love your tag idea. I have 2 large old leather cases full of stuff. But I'm always changing the contents around to make it fit.